Resolution features unique camerawork and intriguing acting, but the story frustratingly raises more questions than it answers. A complex story and continuous, unexpected plot twists are important aspects that more horror films should include. The new horror thriller Resolution, which had its world premiere at the 2012 Tribeca Film Festival, impressively did just that on a limited budget. The two main characters, who are driven by their long friendship together, are fighting to save their complex relationship as they try to uncover the physical horror that’s being unleashed at their door. Resolution follows former best friends Michael (Peter Cilella) and Chris (Vinny Curran) as they argue over their new lifestyles. After receiving a mysterious video of his old friend on drugs, Michael shows up at the abandoned house Chris is illegally living in, and tries to convince him to go to rehab. When Chris refuses to listen to him, Michael handcuffs him to the wall. He plans on waiting there with him for the seven days it takes for the drugs to leave his body. During the week in the house, Michael encounters drug dealers, Indian reservation security and a local cult. 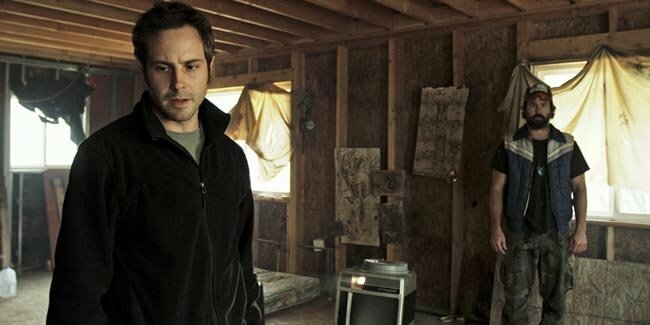 With Chris suffering from withdrawal, Michael becomes obsessed with the several forms of media that strangely show up at the house and in the surrounding woods. Not only must the two contend with their personal demons, they must also fight the past actions and supernatural forces that plague the house. Resolution cinematographer Aaron Scott Moorhead, who also worked on visual effects and co-directed and edited the film with Justin Benson, effortlessly showcases his creative talents here. Moorhead’s seamless, ubiquitous camerawork shows the tension between Michael and Chris from clever intimate and wide-ranging, sweeping angles. His camerawork initially hints that the two characters once had a close relationship but are now estranged. The continued diversified shots subtly suggest that the supernatural forces at work are mysteriously beginning to influence the former friends, particularly Michael. The filmmakers’ unique script also provided a welcome change to the horror thriller genre. Instead of focusing entirely on the actual acts of killing that are seemingly implied to have occurred at the house, Morrhead and Benson provide an intriguing look at the psychological effects murders can have on people. As Michael digs into the history of the area to find out why the pictures, films and recordings are mysteriously showing up at the house, he begins to fall under its supernatural presence. Michael’s emotional state of mind is even comically questioned by Chris as he’s detoxing. Even in his inebriated state, Chris senses there’s something wrong with Michael; he continuously tries to convince him to take off the handcuffs, so that they can leave the house together and save themselves. Cilella and Curran have a natural and fun, but protective, bond with each other. As they eventually begin to experience the horrors of the house together, they convincingly commit to protecting each other. As a horror film, Resolution takes a risk by heavily focusing on the bond between friends and the psychological effects murder has on them, as opposed to the blood and gore of the actual killings. But Moorhead and Benson successfully infuse their film with intrigue and suspense by subtly introducing the local history, which leaves a lasting emotional effect on Chris, and more notably, Michael. While the movie fails to fully explain what’s truly happening to the two friends in the house, their reconnection and backstory provides the much needed details and emotional arc that the genre is severely lacking.